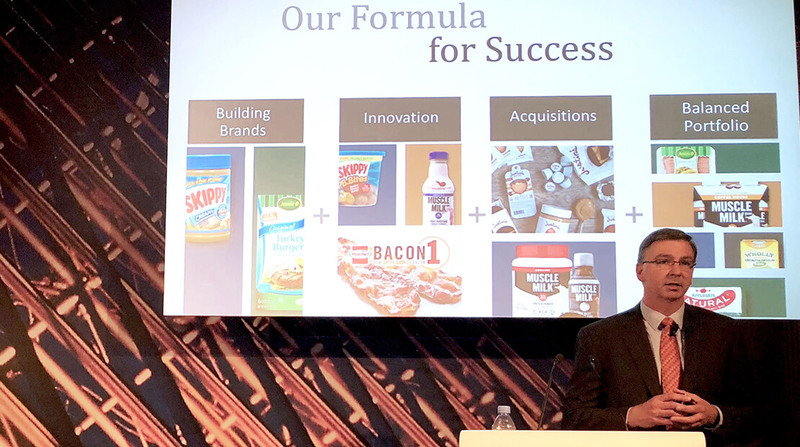 Hormel Foods Corp. is on the path to growth in both its sports nutrition and turkey businesses, James P. Snee, chairman, president and chief executive officer, told analysts at the Deutsche Bank dbAccess Global Consumer Conference held June 12 in Paris. In sports nutrition, Hormel’s presence centers on Muscle Milk, which Mr. Snee said generates more than $300 million. In addition to Muscle Milk, Hormel sees an opportunity to capitalize on some plant-based protein items, Mr. Snee said. He said the company has done quite a bit of work with Evolve, which has products in the ready-to-drink, powder and bar categories.